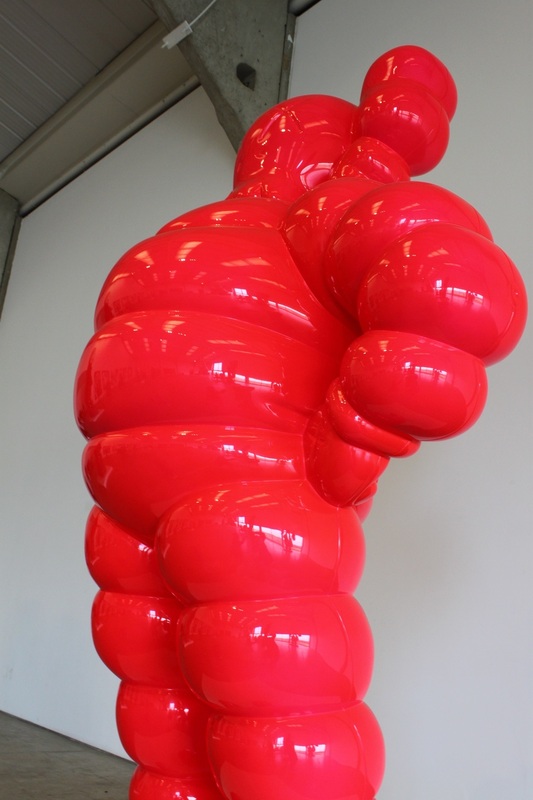 Exhibition: KAWS Status: Mind. Blown. It started with the usual tense car journey, the one you get when you go any sort of distance with smalls ( 1x5yrs and 1x20mths). It ended with one very muddy, tired family but with each one of us feeling warm and fuzzy on the inside. Not destined for immediate success, within 30 minutes of arriving our youngest face planted in the biggest muddiest bog in the car park (not on my watch). Caked doesn't cut it. Think 'room on the broom' when the guys jump out to save the witch. Several packs of baby wipes later and a change of clothes, we were off. The KAWS exhibition at YSP was like no other exhibition for me. I'm no art connoisseur, but I have been privilege to some pretty amazing stuff during my time working on the PR for Chatsworth (the Sotheby's Beyond Limits yearly outdoor sculpture exhibition was always pretty spectacular, not to mention the curated works inside the house). 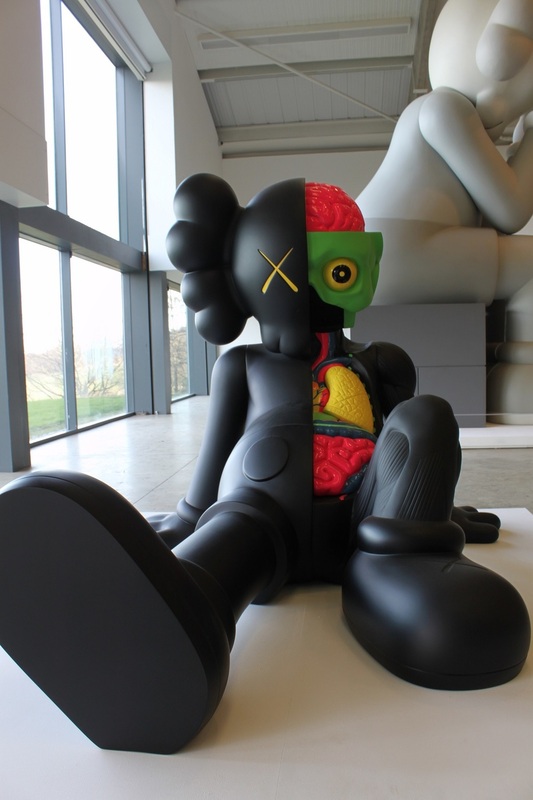 YSP is the first UK gallery to present a major exhibition of work by New York based artist, KAWS and sees the lower park playing host to six of his massive sculptures. The key characters range between three and ten meters in height, all with different personas and all completely amazing. The landscape takes your breath away, as the epic figures start to come into focus and take shape in your line of vision. What struck me most, aside from the sheer size of these babies, was the effort and meticulous planning which would have gone into making each piece and getting them where they were supposed to be. The beauty of the individual characters and the emotion I felt from each one moved me. The colossal figures are made from Afromosia wood, though wood wouldn't have been my first guess. So smooth, so perfect. What an opener! From here we made our way to the Longside Gallery for more figures and a collection of vibrantly layered paintings. Unlike sensible people with pushchairs and the like (in a moment of madness), we decided to shun the free shuttle bus service - opting instead to take the rural walk over the fields. It was exceedingly cold, but once you were under the rays of the warm winter sun and walking uphill, pushing the buggy (whilst your eldest child used it as a pulley system) over a deeply muddy field - you soon warmed up. After what seemed like days, sorry I meant hours, we finally arrived and were welcomed at the gallery by a lovely lady handing out activity sheets, clipboards and pencils for the children. It was warm, visitors young and old are encouraged to linger, admire, reflect and enjoy. This was probably the kids favourite bit and it was great to see them engage and interact with the pieces - sketching them and observing their own interpretations. I got busy taking pictures, something which I love but don't often have time to do these days. We all picked our favourites and headed back to the car park - via the shuttle bus! There were tears, as there inevitably are when you have days out with kids, but there was also lots of laughter and some special shared moments too. I got it - at least my interpretation of it and it was definitely my bag. It might not be everyone's cup of tea, but that's what I love about art and KAWS in particular. I think it should provoke a reaction and an emotion, it should be inclusive and it should make you think and feel something. All hail this extraordinary leading talent, KAWS, he did exactly that for me and my family.